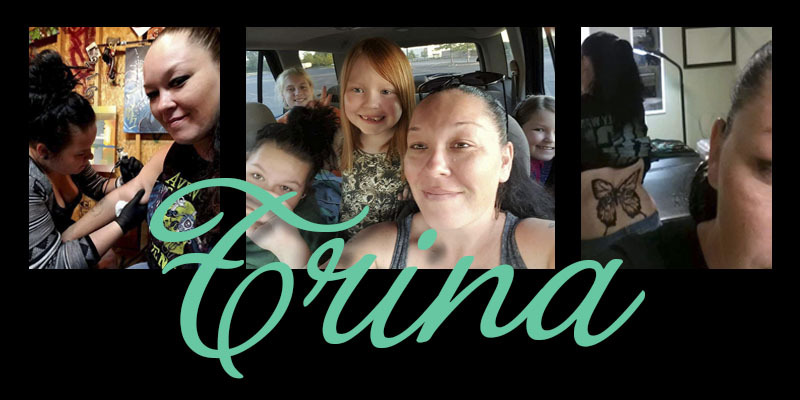 Featured Tattooed Mom: Trina H.
Our next Featured Tattooed Mom is another lovely lady that I know in the real world. She’s tough as nails with a huge heart. I’m so happy she’s an official part of the Tattooed Moms Club! I’m a Mom to 5 girls. I have 3 daughters of my own, I have custody of my oldest daughters biological sister, and I have also helped raise my niece all her life. They range in age from 9-20. I also play Mom to all the neighborhood kids, and the kids I work with. My kids like my tattoos. They all have one that’s specific for them. My kids’ friends think they are awesome and we are always discussing new tattoo ideas and wishes. My parenting style is strict but laid back at the same time. It just depends on the situation. The biggest lesson I’ve learned is being a parent isn’t about what I want for my kids. It’s about me guiding them to be whomever they are destined to be in a positive and accepting environment. Living in a small well to do suburb I’ve faced discrimination a few times. The other moms aren’t as friendly and often give me dirty looks or make rude comments within their little groups. I have 22 tattoos and counting. I have 1 main artist, Scott Cutlip. But, my daughter Alexis has been apprenticing under him and has done quite a few of mine also. I have a few favorites: A butterfly with a cancer ribbon for my Dad, a coverup of a butterfly that is featured on one of my favorite bands (Mushroomhead) CD covers; both done by Scott Cutlip. My last favorite is a music note heartbeat that my daughter drew up and did for me. I was 18 when I got my 1st tattoo, it’s a black rose with my name in it. My idea of me-time is getting coffee and going for a drive in the park. I also like to go to concerts and of course get new tattoos. My family is very close. I’ve had time to hear stories about my ancestors. I would rather go into the future and see my Great Grandchildren – to see my babies’, babies and get to know them. Thanks so much for sharing a bit of your story with us, Trina!! We’re happy to have you as part of the Moms Club!! All featured moms are part of the “Moms Club” and you can find all of their posts in the Moms Club category. Get to know the moms in the club – they’re all amazing! Prev post Featured Tattooed Mom: Chris M.
Next post Featured Tattooed Mom: Jill L.